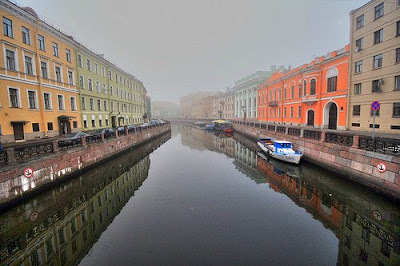 In St. Petersburg Russia.. Much more to come on that, you can bet on it! I met vegetarian celeb chef Didi Emmons back in 2003 when Marché hosted a prix fix dinner featuring dishes from her new book Entertaining for a Veggie Planet. At the time I was the only practicing vegetarian on the Marché staff, and she signed my book with what I took as a wink of added appreciation! Little did I know that long after my herbivore days this award-winning veggie-Bible would remain one of my quintessential go-to cookbooks for almost every occasion. A heavily treaded page which has become my summer potluck staple is Didi's trendy party twist "Hip Dip". With a deceptive guacamole hue, this more robust dip is refreshingly light and zesty, and obviously a health-concious alternative to pure avo. So for that last BBQ of the season or your next cocktail party, try whipping up this dip with some dry-baked flour tortilla triangles. I promise you that people will ask for the recipe. Place the frozen edamame in a colander and rinse under hot running water until they are mostly thawed, about 30 seconds. In a food processor, coarsely purée the edamame and the remaining ingredients with 2 tablespoons water, leaving some chunks. Adjust the seasonings to taste. Transfer to a serving bowl and, if you like, place lime slices on the sides of the bowl. Serve immediately or refrigerate and serve within a few hours. Before the Summer sun sets behind the breakers (for the slightly-less-warm Autumn sun) make sure to head out to the "Riviera of America" for a Mai Tai topped with seabreeze on the deck of the fabulous new Malibu Pier Club. Part of the newly reopened historic Malibu Pier this past spring, the Malibu Pier Club and sister restaurant The Beachcomber offer tasteful coastal dishes with a hefty side of vintage surf ambiance. Out on the deck, only the bar menu is available - but fear not - the Kobe burger was one of the best I've had in LA, a heaping 1/2 pounder dripping with melted gruyere and bacon grease from the impossible-to-bite-around artisan roll. The second half was even better later that night, cold. THAT'S a good burger. 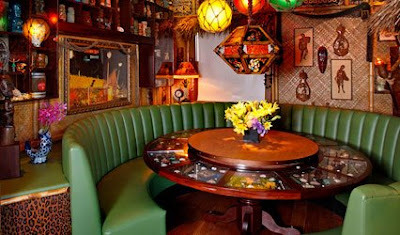 Inside the compact bar, tucked away in the far corner is one of the best private dining rooms/tables I've seen in town, a tiki homage aptly titled the Tonga Lei Room (pictured) where I might just have to host my next post-beach 10-person special event.